Ouisie turned three on Monday. Her birthday came in a flash and reminded me, again, how quickly time flies when you’re having fun. Chef and I agreed Ouisie was old enough to enjoy a birthday party with friends but wanted to keep it small and cost-effective. We decided to host the party at the cottage which, in turn, limited our number of invitees and saved money on private hire fees. Ouisie’s only request was for a snowman birthday cake. With no snow in the forecast, I skipped a Frozen themed party. Like many toddlers, Ouisie’s interests vary according to her mood. 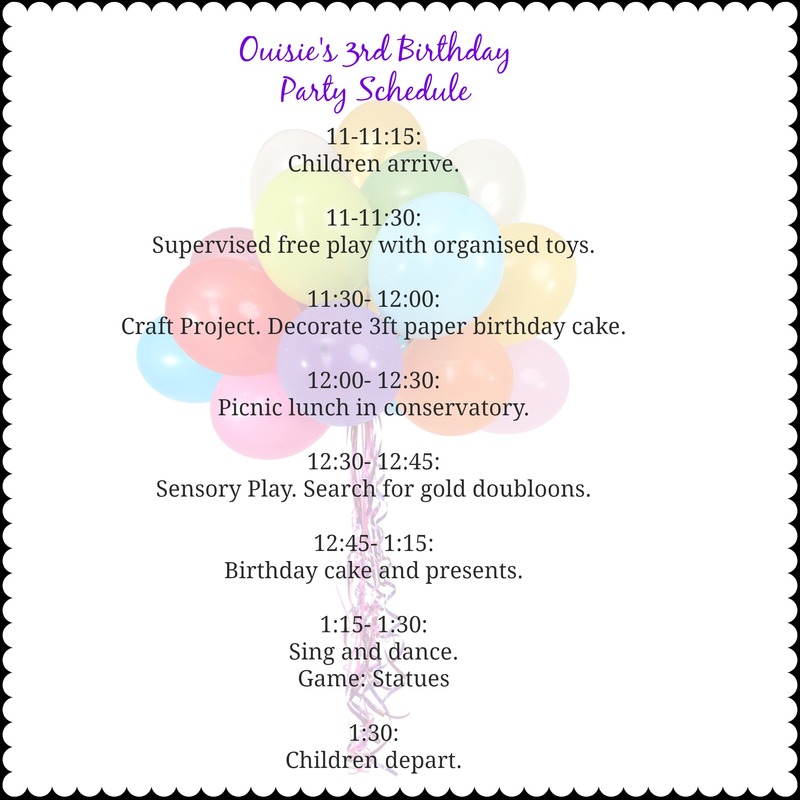 And so, instead of picking one theme for the party, I planned various activities around some of her interests including crafts, make-believe, and dance. As you cannot rely on English weather, especially in the winter, I planned only indoor games and activities for toddlers. Decorations were mostly balloons with a colour palette centred around her favourite colours: green, pink and purple. For the picnic lunch we served various finger foods including: sausages, raw vegetables and hummus, cubed cheddar cheese, fish crackers, and fruit. The children had the beverage choice of plain, chocolate or strawberry milk. No surprise, the brown and pink milk were far more popular than the white! Keep the number of guests to a minimum. The young honoree can easily become overwhelmed and, face it, too many toddlers equates to chaos. A good rule of thumb: invite one or two more friends than the age of your child. For her 3rd birthday, we invited four of Ouisie’s friends. No parents allowed. Without their parents, the toddlers readily engaged in the activities. Moreover, we were able to focus all of our attention on ensuring the little ones had fun. Plan a flexible schedule of events. The birthday party was from 11am- 1:30pm. We allowed 30-minutes for arrivals and for the children to settle in. There were three main activities planned and an additional two or three games if time allowed (or the toddlers tired of the main activities). Organize the play areas. With limited square feet in our cottage, we removed some furniture and grouped toys into play centres to help streamline their focus. Stay five minutes ahead. With a toddler’s limited attention span, ensure you stay five minutes ahead of their next thought. Anticipate their needs and be ready to persuade participation in group activities. I loved the idea of a craft but did not want to have a mess to clean up mid-party. I first read about this craft on Happy Hooligans. It fit the bill and the result was a precious keepsake for Ouisie made by her friends. Large sheet of weighted paper or poster board. Magic Nuudles: If you have not discovered Magic Nuudles, be prepared to be impressed! They are a mess-free, tactile, and easy for toddlers to grip and stick. Prepare the craft in advance by drawing a large 3-tiered cake on weighted paper/poster board. Cut out the cake. Divide tiers of cake by glueing crumpled coloured tissue paper. (May also be done afterwards, but I did before to help direct children to the individual tiers). Create candles out of coloured cardstock and glue to popsicle stick. Using hot glue gun, attach the candles to the top of cake. Place Magic Nuudles in a basket and arrange Do a Dot Markers on a tray. Allow the toddlers to shake the Do a Dot Markers. Have the toddler press the marker onto scrap paper until ink comes to tip and then direct their attention to making dots on the cake. Place damp sponges for toddlers to moisten Magic Nuudles and apply to cake. Distribute a few stickers to each child to apply to the cake. SENSORY PLAY: Pirate treasure hunt for gold doubloons. Sensory play is always a great option for toddlers. I wanted to incorporate Ouisie’s love of pirates and hunting for buried treasure into a fun indoor quest. An old sandbox, Panko crumbs and gold doubloons were my solution. While my mother supervised lunch, Chef and I assembled the sandbox. The toddlers transformed into pirates with cotton napkins tied around their heads. Each pirate was given an organza bags to hold their collected treasures. 2-3 kg Panko Crumbs (or Pinto Beans where available). Fill sandbox with Panko crumbs. Bury gold doubloons, seashells and other trinkets. Place shovels, rakes and spoons in sandbox for children to use. Have children search for gold doubloons. Other trinkets create fun talking points. Each child takes home collected gold doubloons. The party was a great success as were able to care and cater to the four children, and a variety of activities kept their attention. I was delighted to receive messages from the parents saying their child was still talking about the party hours later. But the highest compliment came from Ouisie as she hugged me goodnight. Mom, I had the most amazing day. That spells success in my book. And in actual fact, I enjoyed the party just as much (if not more) than the birthday girl.